ALBERT P. MOCNIAK, 87, passed away March 4, 2013. Beloved husband of the late Stella (nee Buczkiewicz); dearest father of the late Howard and Robert E. Lee; dear grandfather of Deborah (Chris) McKenna and Richard Lee; great-grandfather of Mary Grace Fasulo Lee; brother of the late Joseph and John (Marilyn); brother-in-law of Ted and Elsie Buczkiewicz; dear uncle and great-uncle of many. Past Post Commander of P.L.A.V. [Polish Legion of American Veterans] Roosevelt Post 58, member of Knights of Columbus Trinity Council 4217, American Legion Post 572 and the Ukrainian American Veterans Post 24. Mass of Christian Burial St. Francis De Sales Catholic Church, (State and Snow Rds. ), Parma on Saturday, March 9 at 10 a.m.
Interment Holy Cross Cemetery. The family will receive friends in the TOMON & SONS FUNERAL HOME, 4772 PEARL RD. (N. OF BROOKPARK RD. ), CLEVELAND ON FRIDAY FROM 4-8 P.M. In lieu of flowers, family suggests contributions to P.L.A.V. Post 58 or St. Augustine Hunger Center in memory of Al. P.L.A.V. Post 58 Final Salute, Friday evening at 7 p.m. Grave marker for Albert P. Mocniak in Holy Cross Cemetery, Brook Park (Cuyahoga county), Ohio. 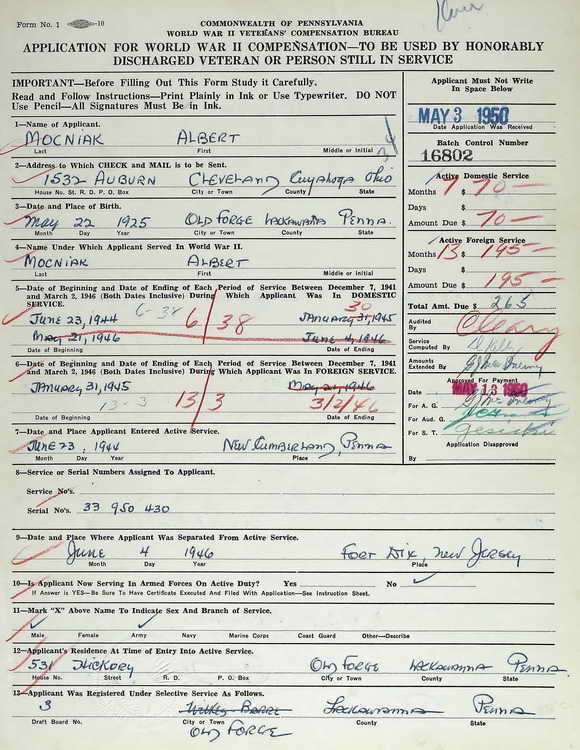 Albert enlisted in the Army at New Cumberland, PA on 23 June 1944. This small news article appeared in the Wilkes Barre Times Leader, Wilkes Barre, PA on 30 June 1945 announcing that Albert had completed jump school and earned his parachutist badge. 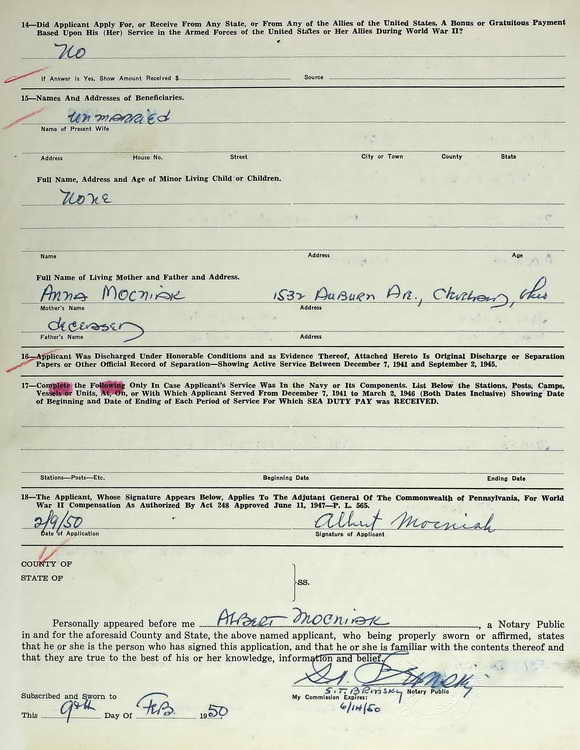 Pennsylvania WWII Veterans Bonus application submitted by Albert on 9 February 1950 details his service dates. He was credited with 7 months of domestic duty and 13 months overseas for a total bonus of $265.